(1) Notker Balbulus (Stammerer), Blessed, monk and author, b. about 840, at Jonswil, canton of St. Gall (Switzerland); d. 912. Of a distinguished family, he received his education with Tuotilo, originator of tropes, at St. Gall’s, from Iso and the Irishman Moengall, teachers in the monastic school. He became a monk there and is mentioned as librarian (890), and as master of guests (892-94). He was chiefly active as teacher, and displayed refinement of taste as poet and author. He completed Erchanbert’s chronicle (816), arranged a martyrology, and composed a metrical biography of St. Gall. It is practically accepted that he is the “monk of St. Gall” (monachus Sangallensis), author of the legends and anecdotes “Gesta Caroli Magni”. The number of works ascribed to him is constantly increasing. He introduced the sequence, a new species of religious lyric, into Germany. It had been the custom to prolong the Alleluia in the Mass before the Gospel, modulating through a skillfully harmonized series of tones. Notker learned how to fit the separate syllables of a Latin text to the tones of this jubilation; this poem was called the sequence (q.v. ), formerly called the “jubilation”. (The reason for this name is uncertain.) Between 881-887 Notker dedicated a collection of such verses to Bishop Liutward of Vercelli, but it is not known which or how many are his. Ekkehard IV, the historiographer of St. Gall, speaks of fifty sequences attributable to Notker. The hymn, “Media Vita”, was erroneously attributed to him late in the Middle Ages. Ekkehard IV lauds him as “delicate of body but not of mind, stuttering of tongue but not of intellect, pushing boldly forward in things Divine, a vessel of the Holy Spirit without equal in his time”. 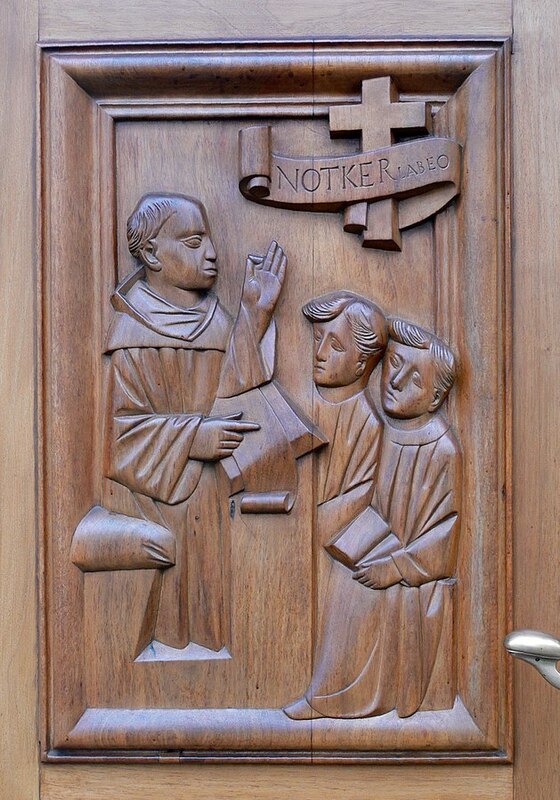 Notker was beatified in 1512. (1) CHEVALIER Bio-bibl., s. v.; MEYER VON KNONAU in Realencyk fur prot. Theol., s. v.; WERNER, Notker’s Sequenzen (Aarau, 1901); BLUME, Analecta hymnica, LIII (Leipzig, 1911). 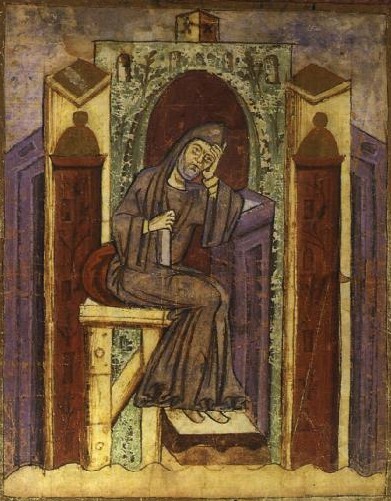 (2) Notker Labeo, monk in St. Gall and author, b. about 950; d. 1022. He was descended from a noble family and nephew of Ekkehard I, the poet of Waltharius. “Labeo” means “the thick lipped”, later he was named “the German” (Teutonicus) in recognition of his services to the language. He came to St. Gall when only a boy, and there acquired a vast and varied knowledge by omnivorous reading. His contemporaries admired him as a theologian, philologist, mathematician, astronomer, connoisseur of music, and poet. He tells of his studies and his literary work in a letter to Bishop Hugo of Sitten (998-1017), but was obliged to give up the study of the liberal arts in order to devote himself to teaching. For the benefit of his pupils he had undertaken something before unheard, namely translations from Latin into German. He mentions eleven of these translations, but unfortunately only five are preserved: (1) Boethius, “De consolatione philosophiae”; (2) Marcianus Capella, “De nuptiis Philologiae et Mercurii”; (3) Aristotle, “De categoriis”; (4) Aristotle, “De interpretatione”; (5) “The Psalter”. Among those lost are: “The Book of Job”, at which he worked for more than five years; “Disticha Catonis”; Vergil’s “Bucolica”; and the “Andria” of Terenz. Of his own writings he mentions in the above letter a “New Rhetoric” and a “New Computus” and a few other smaller works in Latin. We still possess the Rhetoric, the Computus (a manual for calculating the dates of ecclesiastical celebrations, especially of Easter), the essay “De partibus logicae”, and the German essay on Music. In Kögel’s opinion Notker Labeo was one of the greatest stylists in German literature. “His achievements in this respect seem almost marvelous.” His style, where it becomes most brilliant, is essentially poetical; he observes with surprising exactitude the laws of the language. Latin and German he commanded with equal fluency; and while he did not understand Greek, he was weak enough to pretend that he did. He put an enormous amount of learning and erudition into his commentaries on his translations. There everything may be found that was of interest in his time, philosophy, universal and literary history, natural science, astronomy. He frequently quotes the classics and the Fathers of the Church. It is characteristic of Notker that at his dying request the poor were fed, and that he asked to be buried in the clothes which he was wearing in order that none might see the heavy chain with which he had been in the habit of mortifying his body. (3) Notker Physicus (surnamed Piperis Granum), physician and painter, d. 12 Nov., 975. He received his surname on account of his strict discipline. Concerning his life we only know that in 956 or 957 he became cellarius, and in 965 hospitarius at St. Gall. Ekkehard IV extols several of his paintings, and mentions some antiphons and hymns of his composition (e.g. the hymn “Rector aeterni metuende secli”). He is probabIy identical with a “Notker notarius”, who enjoyed great consideration at the court of Otto I on account of his skill in medicine, and whose knowledge of medical books is celebrated by Ekkehard. In 940 this Notker wrote at Quedlinburg the confirmation of the immunity of St. Gall. This is in accord with the great partiality later shown by the Ottos towards the monk, for example when they visited St. Gall in 972. 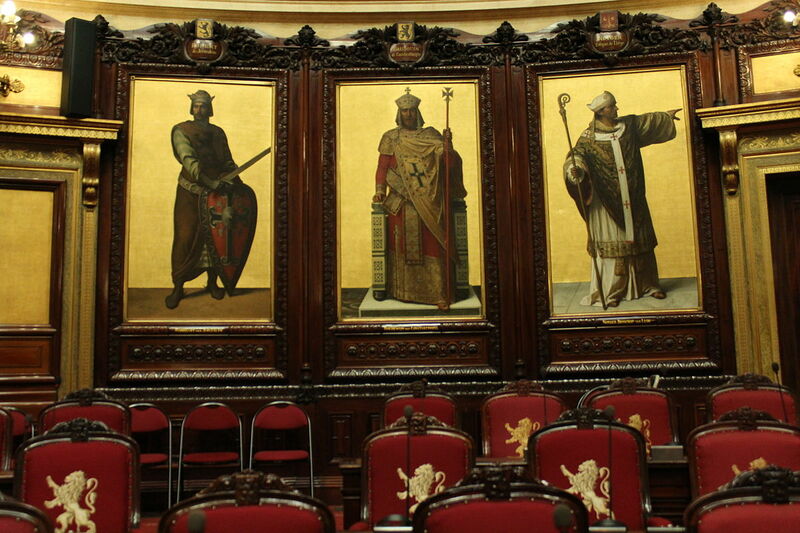 Paintings of Louis Gallait adorning the walls of the Chamber of the Belgian Senate in the Palace of the Nation, representing Left to Right: Robert of Jerusalem, Baldwin I of Constantinople and Notger, Bishop of Liège. Photo by M0tty. (4) Notker, nephew of Notker Physicus, d. 15 Dec., 975. We have no documentary information concerning him until his appointment as Abbot of St. Gall (971). Otherwise also the sources are silent concerning him, except that they call him “abba benignus” and laud his unaffected piety. (5) Notker, Provost of St. Gall and later Bishop of Liège, b. about 940; died 10 April, 1008. This celebrated monk is not mentioned by the otherwise prolix historians of St. Gall. He probably belonged to a noble Swabian family, and in 969 was appointed imperial chaplain in Italy. From 969 to 1008 he was bishop of Liège. Through him the influence of St Gall was extended to wider circles. He laid the foundation of the great fame of the Liège Schools, to which studious youths soon flocked from all Christendom. By procuring the services of Leo the Calabrian and thus making possible the study of Greek, Notker gave notable extension to the Liège curriculum. Among Notker’s pupils, who extended the influence of the Liège schools to ever wider circles, may be mentioned Hubald, Gunther of Salzburg, Ruthard and Erlwin of Cambrai, Heimo of Verdun, Hesselo of Toul, and Adalbald of Utrecht. A noteworthy architectural activity also manifested itself under Notker. In Folcwin’s opinion Notker’s achievements surpass those of any of his predecessors: among the buildings erected by bim may be mentioned St. John’s in Liège, after the model of the Aachen cathedral. 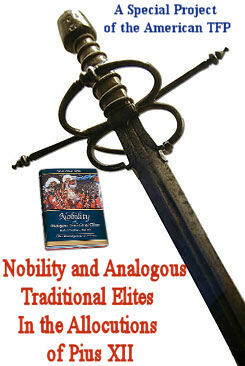 Praiseworthy also were his services as a politician under Otto III and Henry II. He adhered faithfully to the cause of the romantic Otto, whom he accompanied to Rome. 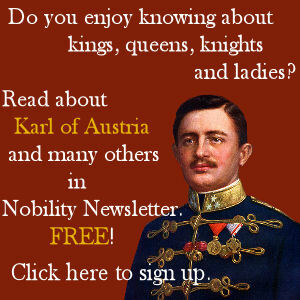 It was also he who brought back the corpse of the young emperor to Germany. The “Gesta episcoporum Leodiensium” have been frequently wrongly attributed to him, although he merely suggested its composition, and lent the work his name to secure it greater authority. (5) WATTENBACH, Deutschlands Geschichtsquellen im Mittelalter, I (7th ed., Stuttgart, 1904), 425 sqq. A Vita Notkeri (12th cent.) is partly preserved by AEGIDIUS OF ORVAL; cf.. KURTH, Biogr. de l’eveque Notger au XII. S. in Bull. de la Comm. royale d’hist de Belgigue 4th series, XVII (189l), n. 4.; Biogr. de l’eveque N. au XII s. in revue benedictine VIII (1891), 309 sqq.